Read the following passage, then answer the questions below. A general tax measure sparked the greatest organized resistance. Known as the "Stamp Act," it required all newspapers, broadsides, pamphlets, licenses, leases, and other legal documents to bear revenue stamps. The proceeds, collected by American customs agents, would be used for "defending, protecting, and securing" the colonies. Bearing equally on people who did any kind of business, the Stamp Act aroused the hostility of the most powerful and articulate groups in the American population: journalists, lawyers, clergymen, merchants and businessmen, North and South, East and West. Leading merchants organized for resistance and formed nonimportation associations. Trade with the mother country fell off sharply in the summer of 1765, as prominent men organized themselves into the "Sons of Liberty" – secret organizations formed to protest the Stamp Act, often through violent means. From Massachusetts to South Carolina, mobs, forcing luckless customs agents to resign their offices, destroyed the hated stamps. Militant resistance effectively nullified the Act. Spurred by delegate Patrick Henry, the Virginia House of Burgesses passed a set of resolutions in May denouncing taxation without representation as a threat to colonial liberties. It asserted that Virginians, enjoying the rights of Englishmen, could be taxed only by their own representatives. The Massachusetts Assembly invited all the colonies to appoint delegates to a “Stamp Act Congress” in New York, held in October 1765, to consider appeals for relief to the Crown and Parliament. Twenty-seven representatives from nine colonies seized the opportunity to mobilize colonial opinion. After much debate, the congress adopted a set of resolutions asserting that "no taxes ever have been or can be constitutionally imposed on them, but by their respective legislatures," and that the Stamp Act had a "manifest tendency to subvert the rights and liberties of the colonists." Instructions on how to enable your browser are contained in the help file. 1. The _____ required all newspapers, broadsides, pamphlets, licenses, leases, and other legal documents to bear revenue stamps. 2. 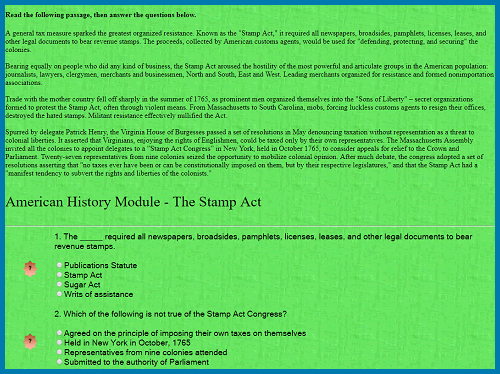 Which of the following is not true of the Stamp Act Congress? 3. Spurred by whom, the Virginia House of Burgesses passed a set of resolutions in May, 1765, denouncing taxation without representation as a threat to colonial liberties? 4. Secret organizations formed to protest the Stamp Act, often through violent means, were known as what?